Caption slip reads: "Photographer: Mitchell. Date: 1954-06-23. Reporter: Sid Bernstein. Assignment: Interview of Dr. Lucy Adams, Program Officer of U.S. Mission to Iran. On home leave after two years. 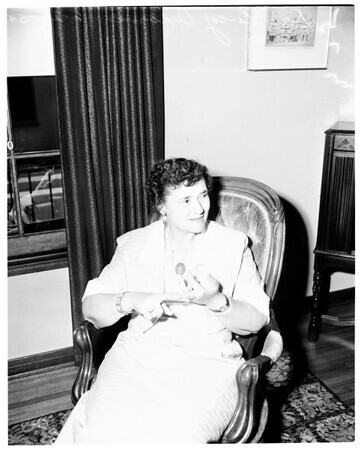 75/76: Dr. Lucy Adam gestures during interview. Interview takes place at home of friend in Glendale".